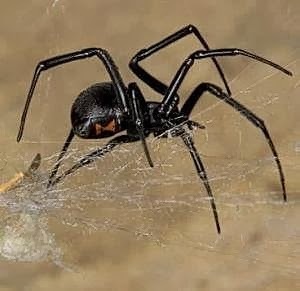 Science Daily — Biologists at the University of California, Riverside have identified the genes, and determined the DNA sequences, for two key proteins in the "dragline silk" of the black widow spider -- an advance that may lead to a variety of new materials for industrial, medical and military uses. The black widow spider's dragline silk is a standout compared to other spider silks because of its superior strength and extensibility, a combination which enables black widow dragline silk to absorb enormous amounts of energy. These properties suggest that synthetically-produced silk might find applications as diverse as lightweight super-strong body armor, components of medical devices and high-tech athletic attire. The researchers -- Associate Professor of Biology Cheryl Hayashi, postdoctoral researchers Nadia Ayoub and Jessica Garb, and graduate students Robin Tinghitella and Matthew Collin -- report their findings in the June 13 online edition of the journal PLoS ONE. 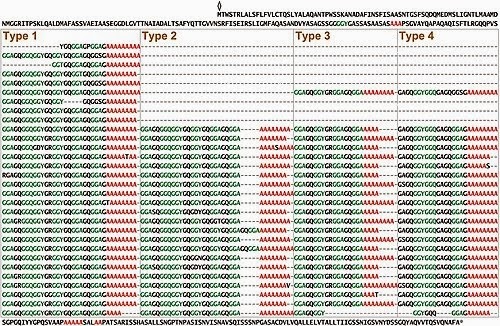 In the article, they describe their work to identify the genes encoding the two key proteins, named MaSp1 and MaSp2, and determine the genes' complete DNA sequences. The UCR Office of Technology Commercialization has filed a patent application on the gene sequences. 圖3. 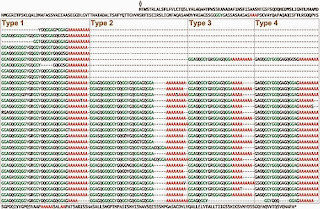 Complete amino acid sequence for L. hesperus major ampullate spidroin 1 (MaSp1). The sequence is read from left to right and then top to bottom. The diamond marks the start position and the asterisk denotes the stop position. The protein is dominated by poly-A (red) and GGX (green) motifs. The majority of the sequence can be categorized into four types of ensemble repeat units. Repeats of each type are aligned within a box. Gaps (-) have been inserted in order to align repeat units within a type. There are currently no products on the market based on the dragline silk of spiders. "There's nothing quite as good yet as natural dragline silk, but we should get a lot closer now that we have the full genetic recipe," Hayashi said. With the ingredients and their genetic blueprint now known, it may be possible to synthetically produce the proteins by inserting the genetic sequences into host organisms such as bacteria, plants or animals, she said. Once the pure proteins are harvested, a manufacturing challenge will be spinning them into silk fibers that have the same remarkable properties as spider spun silk. 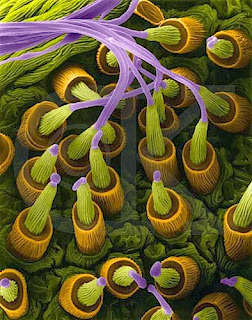 But several advances have recently been made in artificial spinning methods. When spiders manufacture dragline silk, their silk glands produce a "gooey" slurry of the proteins needed, which are transported to the spinneret through a duct where the proteins interact and align to form the silk strands. "The production of artificial silk is not quite there yet," Hayashi said. "Now, with the full length genes known and as we learn more about theses two proteins, hopefully we will have a better shot at mimicking nature." Spider silks have some of the best mechanical properties of any known natural fibers, thus they are being considered in the improvement of a variety of products including surgical microsutures and specialty ropes. Dragline silk -- just one type of the seven different silks that an individual spider produces -- are used by spiders as the structural foundation of their webs and to support their body weight as they move about. The dragline silk of black widows is one of the strongest and toughest spider silks identified thus far. Note: This story has been adapted from a news release issued by University of California - Riverside. "Blueprint for a High-Performance Biomaterial: Full-Length Spider Dragline Silk Genes ", PLoS ONE, 2007, 2(6): e514.